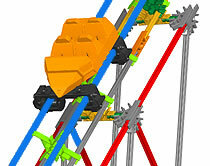 All current Classic K'NEX Roller coasters are based on the coaster car shown in the photo. The track is made from split tubing, in purple, blue, red or yellow. The tubing is thicker than the orange track used in the original roller coaster. 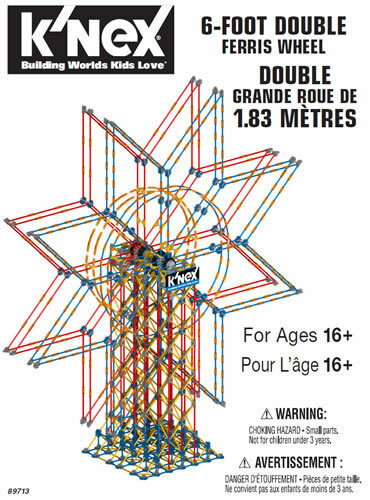 The track is usually attached to the K'NEX model via special "Co-cross ties" (product code 91430 or 91430Y), as shown in the photo. This approach ensures the width of the track remains constant at all times. 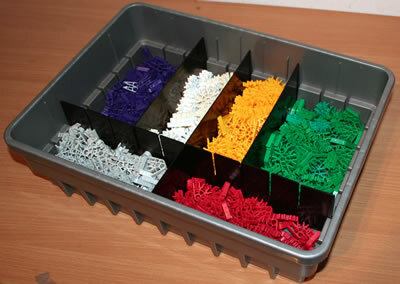 Different lengths of track can also be joined together if required by using the 20501 K'NEX Track Splice, as shown in purple in the photo. Most roller coaster sets provide a train of coaster cars, consisting of a front car, a back car, and (in some cases) one or more middle cars. 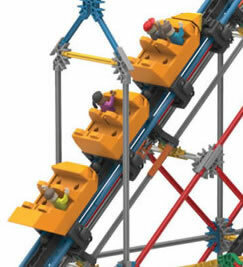 Click here to download the Instruction book for an example of a recent classic K'NEX roller coaster, the Thunderbolt Strike coaster (.PDF file 11Mb). 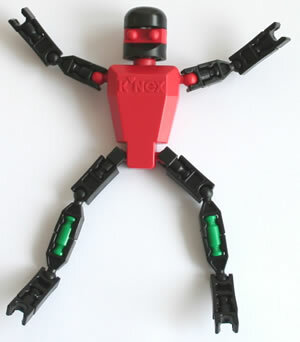 You can also view some examples of Classic K'NEX roller coaster models if you wish.